Deck made by Johann Matheus Backofen, Nürnberg c.1800. Copper engraved stencil coloured deck of 52 cards with original wrapper. Johann Matthaus Backofen of Nürnberg is known from packs produced during the period c.1780-c.1810 including Italian-suited Trappola packs, Animal Tarots and fortune-telling cards. In this pack the Paris-derived court cards have been given an individual style, fashionably dressed including zodiac symbols on some of the costumes. Two of the Kings have lost their crowns. Above: deck manufactured by Johann Matheus Backofen, Nürnberg c.1800. Copper engraved, stencil coloured deck of 52 cards with original wrapper. 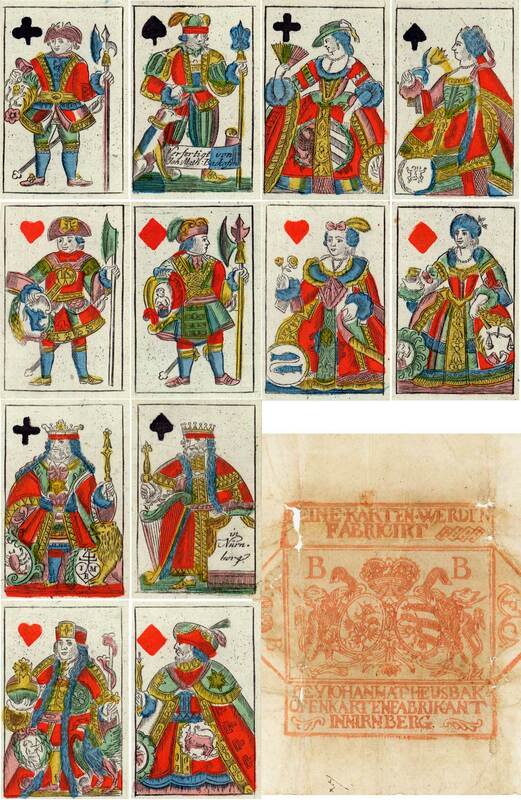 The manufacturer's monogram can be seen on the King of Clubs. From the collection of Klaus-Jürgen Schultz (http://spielkarten-sammlung.de.